Ambrosia is said to be the food of the gods. It is said to be brought to the Greek gods by doves and bestow immortality to whoever consumed it. However, ambrosia, as many in America know it, is a fruit salad clothed in whipped cream or other white creams, such as sour cream, mayonnaise or cream cheese. It usually contains orange sections, pineapple, miniature marshmallows, and shredded coconut. Popularized in the South in the late 1800s, ambrosia continues to be a staple, go to dish for buffets, picnics, and holiday meals. According to early recipes in the 1800s, it usually contained three key ingredients of orange segments, coconut flakes, and sugar. This autumnal, Asian version uses persimmons (as the orange component), coconut cream (instead of coconut flakes), and honey as desired instead of sugar. Fuyu persimmons have long history of consumption in Asia, but the first Asian persimmon made its way to the US in the 1800s by Commander M.C. Perry who brought the seeds back from Japan. Due to failure to fruit, the US Department of Agriculture subsequently imported the seeds from Asian, including the Fuyu persimmon. Most of the persimmons grown today are from the San Joaquin Valley in California. 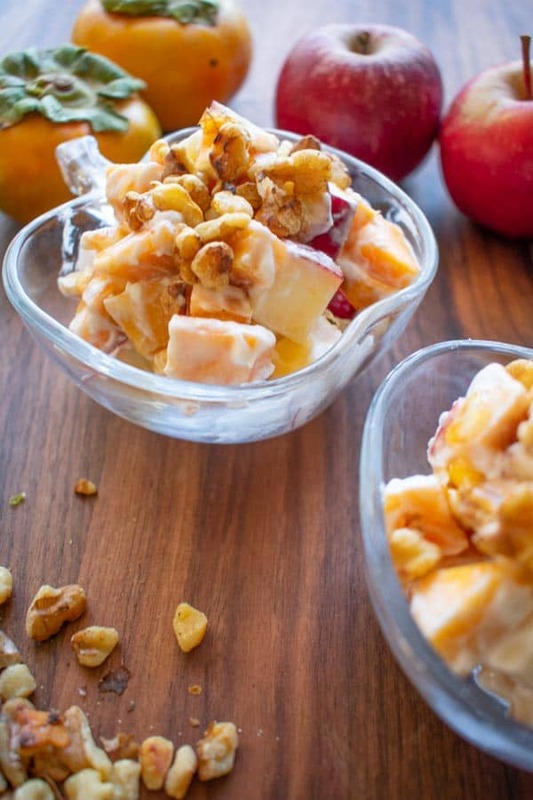 Apples and walnuts are also added for additional crunch, and nutty goodness. 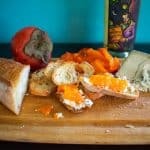 This recipe is inspired by a fall harvest served at the Daly City Farmer’s Market in CA. Instead of using dairy products such as heavy cream, yogurt, or cool whip, this recipe uses coconut cream. This is different from coconut milk, since it has a higher percentage of fat making it thick and creamy. It is sold in cans alongside coconut milk, just look for the “cream” distinction. Coconut cream does contain saturated fat, but it contains medium tri-glyceride (MTC) fats that are beneficial to weight loss and increased metabolism. If the apples and persimmons are sweet enough, this really does not need any additional sweetness. However, a natural sweetener such as honey or agave would be recommended. 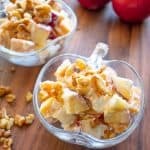 In order to make this ambrosia salad really healthy, you would leave the skin on apples and persimmons, since they have most of the fiber, vitamins, and antioxidants. Because the apples are coated in coconut cream, you can make this ahead of time, and they won’t turn brown. Store up to two days in the fridge. This could also be packed into lunch boxes for a crunchy little snack. Is it a salad or dessert? It would really be comfortable as either course. It’s not too sweet to spoil your appetite before the main course, and it’s nice to have something in the fridge ready to be called on when you need it. 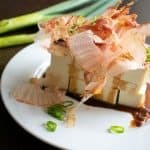 It is reminiscent though of the Japanese and Korean savory apples salad that are coated with mayonnaise. This version, however, is just a bit sweeter. Spread walnuts onto a pan over medium heat. Keep stirring until the walnuts are slightly colored. Remove from hot pan. Alternately, spread on a sheet pan and toast for 5-7 minutes. 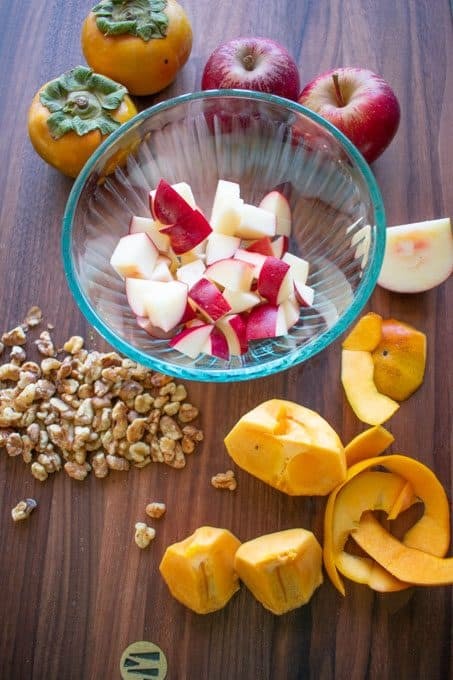 Peel persimmons and apples if you wish. Chop into bite size pieces of your choice. 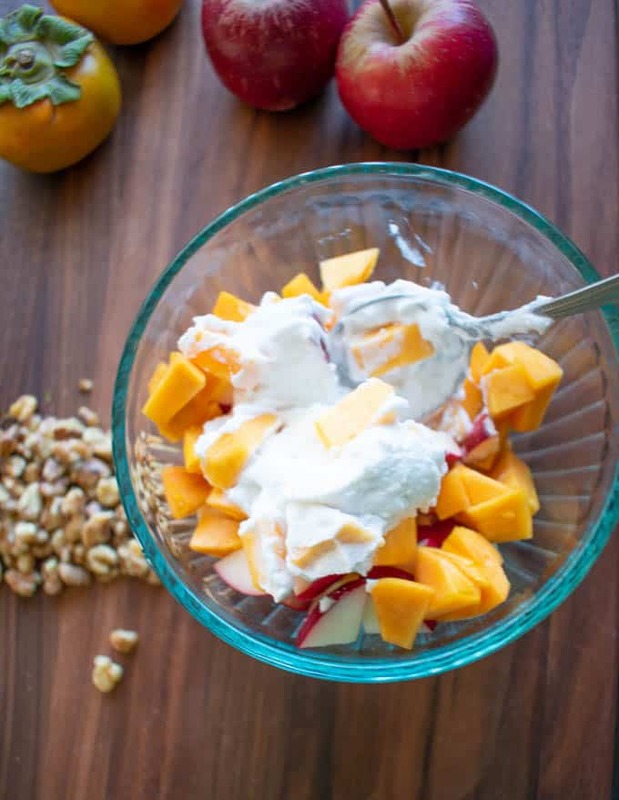 Mix the persimmons and apples with coconut cream. 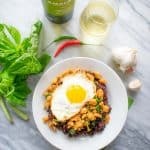 Don’t you just love a recipe where everything just gets mixed in a bowl? 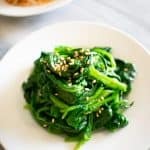 Serve immediately or store in the fridge for up to 2 days. The coconut cream will harden in the fridge, so let it sit at room temperature for 10-15 minutes to soften. 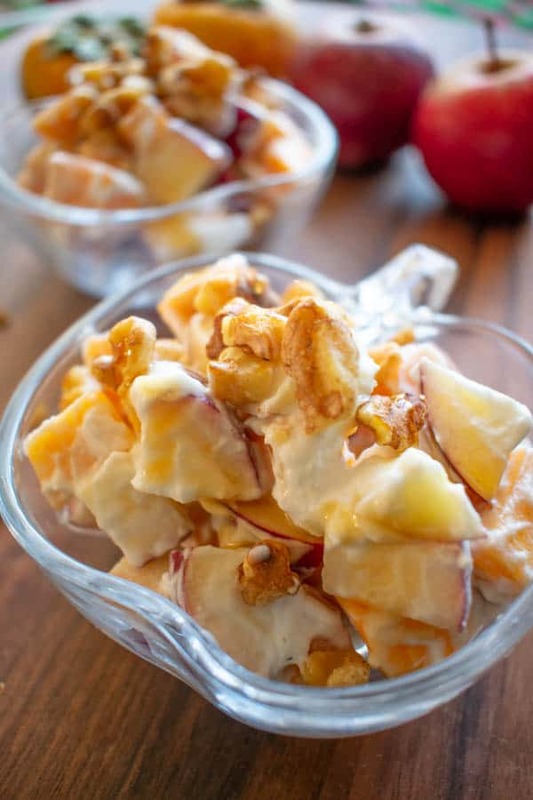 Try making this EASY and crunchy version of ambrosia while fuyu persimmons are still in season. 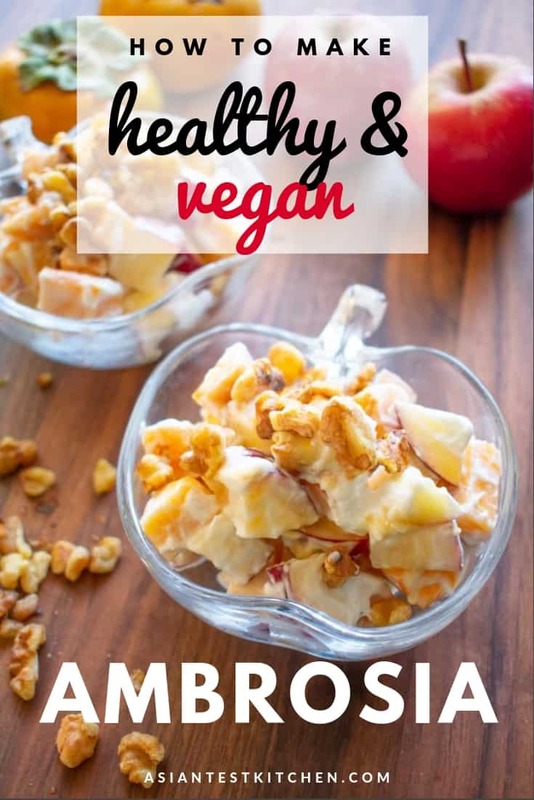 This lightened version of ambrosia is dairy free, crunchy, and allows you to chop apples ahead of time without turning brown. Toss all ingredients together. 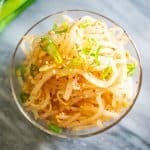 Reserve some walnuts to garnish on top. 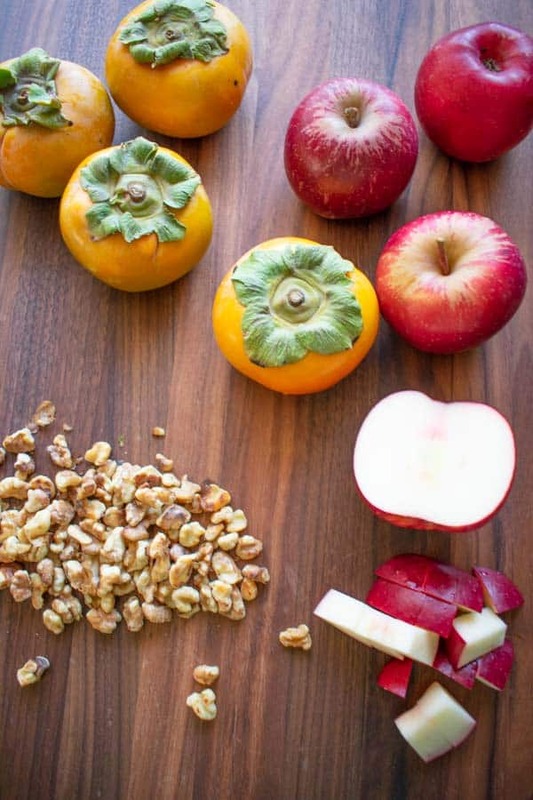 Do you feel love the apples, orange persimmons, and the fall season? Please spread the Asian ♥ and share!